Tomato sauce with Mediterranean vegetables. Serves 4. 1 of your 5 a day. No artificial colours, flavours or preservatives. Suitable for vegetarians. 1 portion = 1 of your 5 a day recommended intake of fruit and vegetables, as advised by nutritionists. Bring on the bake! Simply cook your choice of pasta and place in an ovenproof dish. Pour over your DOLMIO Sauce for Pasta Bake, stir through and sprinkle with cheese. Bake in a hot oven at 200C/Gas Mark 6 for 20 mins until the cheese has melted. We recommend 100g of dry pasta per person. Why not serve with a side salad or your favourite veg. 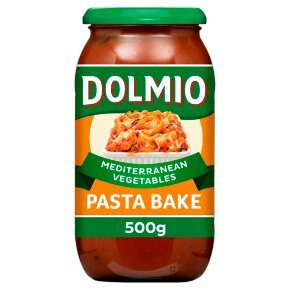 To cook a delicious oven-baked meal that everyone will love: Cook 375g of pasta and place in an ovenproof dish.Pour over sauce, stir through and sprinkle with grated cheese.Bake in an oven preheated to 200C/400F/ Gas mark 6, for about 20 minutes until cheese has melted.DOLMIO�Pasta Bake Tastes Great with ChickenCook 250g of pasta and place in an ovenproof dish.Brown 250g of diced chicken in a little oil for 4-5 minutes and place on the pasta in the oven dish.Pour over sauce, stir through and sprinkle with great cheese.Bake in an oven preheated to 200C/400F Gas mark 6, for about 20 minutes until cheese has melted.